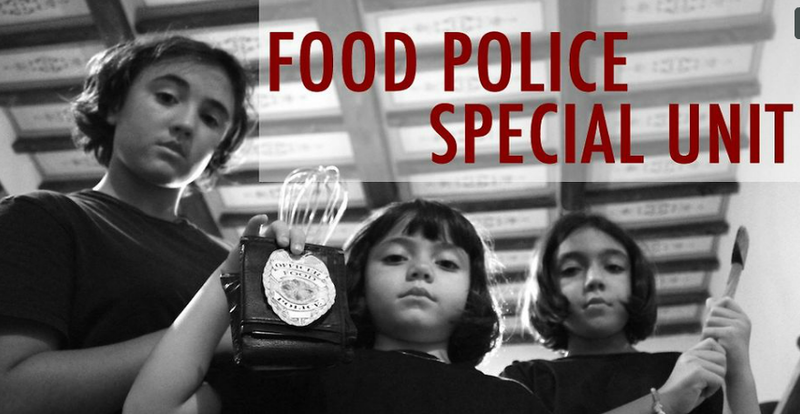 Food Police Episode III from Cross-Pollinate Travel on Vimeo. Frozen food stakeout. In this newest episode, a sous chef comes to the Special Unit ready to confess her involvement in a major crime. Episode I – the girls of the Special Unit hear from the new head of the Food Police that tourists are being ripped off in Rome. They set out to gather evidence and show you what to look out for. Episode II – In this episode, The Food Police – Special Unit, are in the medieval hill-town of Orvieto, famous for its black truffles, in pursuit of a dangerous perp who’s about to commit an unthinkable crime. I don’t draw. Or paint. The only people who have ever seen my attempts at art are my kids when we draw together and although they think I’m pretty awesome, it’s still not something I’d want to pass around or have on display. 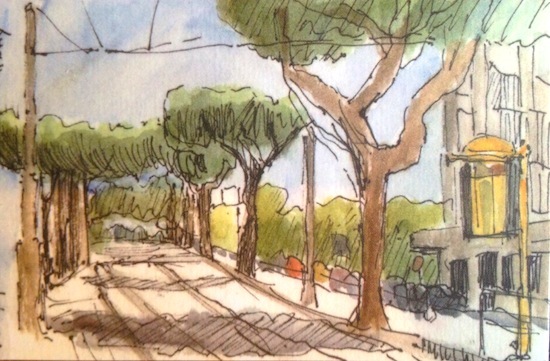 But I wanted to try Kelly Medford’s Sketch Rome Tour because she said it was open to all, and I thought it sounded a like a good, unique idea. 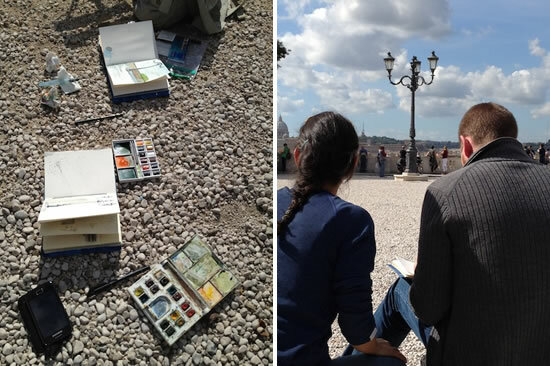 We met at the Pincio at the Villa Borghese overlooking Piazza del Popolo. We were two people on the tour so she had a lot of time for us. 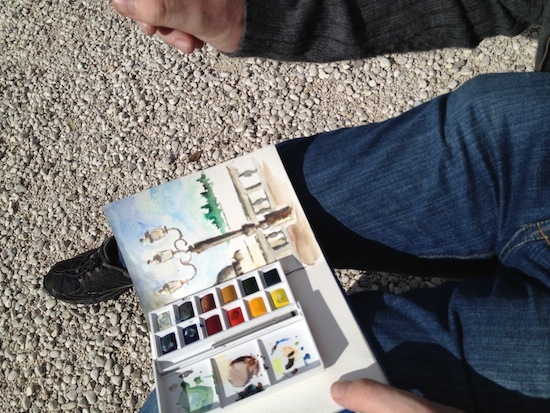 First, she gives you a sketch kit that you get to keep. 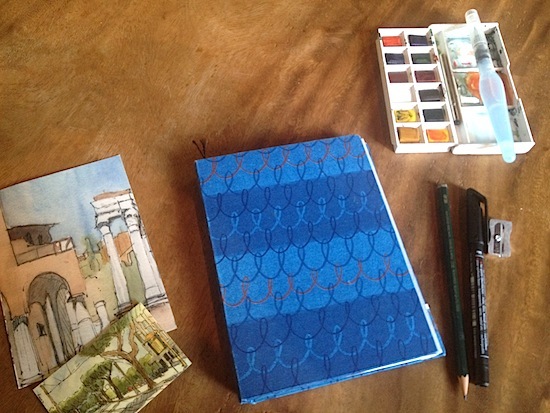 It includes a sketch book that she hand-makes with a variety of papers – not too big as to be intimidating, and with paper that’s designed for different mediums. There is a pencil with sharpener, a pen, and a watercolor kit with a brush that contains its own water tube. Kelly goes over a few techniques, which we then experiment with – line drawing, shading, drawing just the mass without lines. 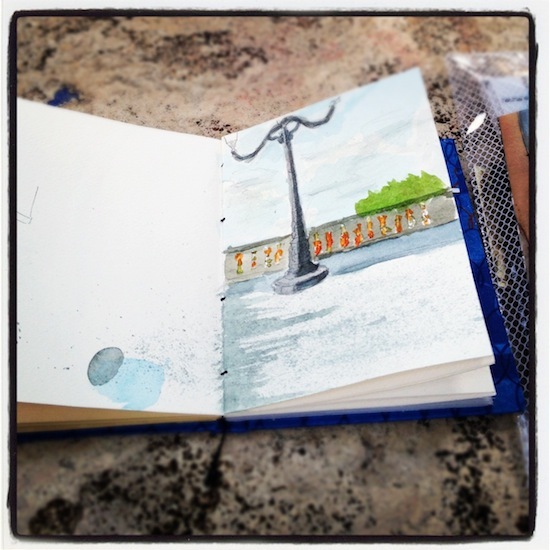 We moved through the park, choosing statues and trees and benches as our subjects, progressing from pencil to ink to watercolors (with a stop for coffee along the way). When you’re clearly stuck, Kelly can show you what you’re doing wrong. For example, I tried to do some clouds and they looked horrible. Kelly showed me how clouds actually fit into the perspective and how to reproduce them – easy to do once she points out why things look the way they do. These little hints help bring you closer to putting what you see on paper, but they aren’t so technically oriented that you lose your intuition and your freedom to draw however you want.